what a fabulous fortnight of sketchy shenanigans ♥JINGLE BELLES♥! once again we thank everyone who played along; there was not a single card we did not love, beacuse you never fail to amaze us with your cleverness and creativity. many thanks to the mega-talented brenda barton for providing the sketch, not to mention a boatload of inspiration. here are a few takes that really made us sit up and take notice! 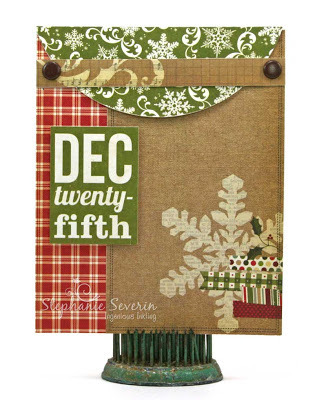 brilliantly stamped on a patchwork of scraps for her charming and sophisticated design! combined beautiful coloring with the softness of vellum to produce a multi-faceted and multi-layered effect! went with a clean and simple approach which definitively proves that less can be more... if you have the talent to pull it off! 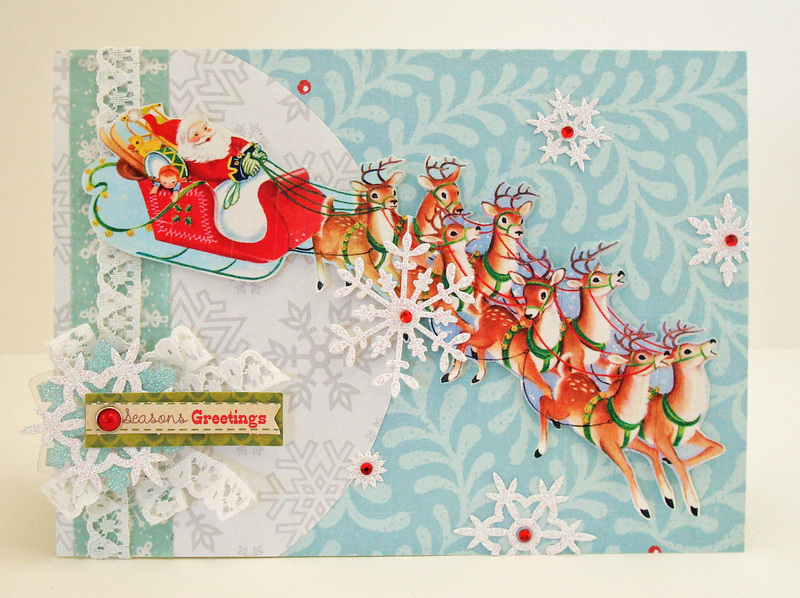 With a sketch as lovely as the one Brenda Barton made for us, how can *anyone* stop at just one card? We couldn't, and we hope that you won't either! 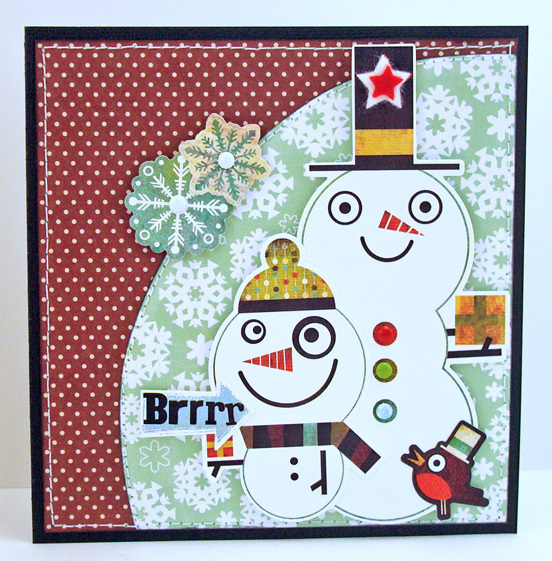 Brenda says, "For the snowman card, I used snowman for the "tall" design element in the sketch. To add some dimension, I tore the half circle on the left and included a few falling snowflakes. The snowman was easy to put together because I used a punch and simply added the face with markers and added highlights with a colored pencil. 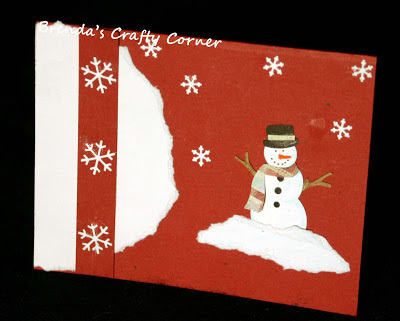 For the snow under the snowman, I added torn white cardstock." 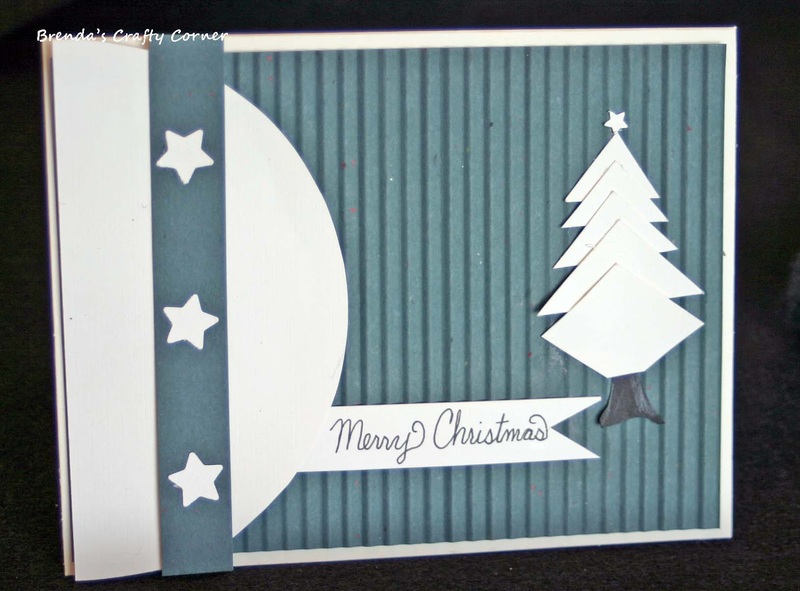 Stephanie says, "For my second card, I flipped the sketch and created a little gift card pocket by scoring a 12" piece of cardstock. I used brads to attach a strip of designer paper (fortified with a layer of cardstock) as a band to tuck in the pocket flap (you can see an open view on my blog). 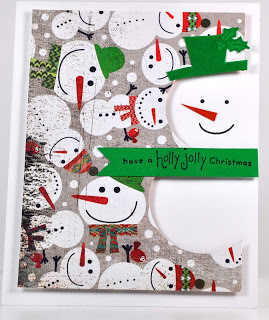 Papers are all from Simple Stories Homemade Holiday." 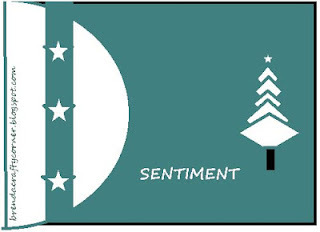 Lauren says, "My starting point this time was a reduced color copy of this beautiful illustration from one of my treasured vintage copies of "The Night Before Christmas", which I wanted to use because I remembered the image of Santa's sleigh silhouetted against a big, full, moon. Well, it turns out I must've remembered that wrong, because NONE of my copies contain such a picture, but I was committed to the idea, lol, so I just went ahead and made my own moon, and I think it came out pretty well!" Be sure to scroll down and check out your fellow belles' lovely work, then link up with us-- or link up again-- before next Wednesday! We're thrilled to have lovely guest star Brenda Barton joining us this week with a fabulous sketch for our creative inspiration. 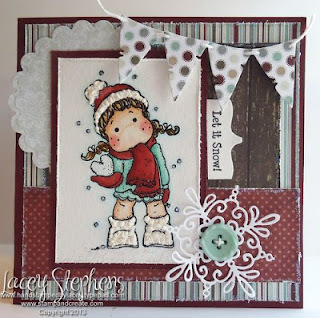 Brenda's beautiful work can be seen on her blog, Brenda's Crafty Corner, as well as at The Sketch File where she is a design team member. We're so excited by her wonderful sketch we cannot wait any longer to show it, and then we'll let Brenda herself tell you a little about the process of creating it and her own gorgeous card! Brenda says, "I decided to try my hand at designing a card sketch with Microsoft Paint, a computer program I've never really used. Both the sketch and card came together quickly. To create the card, I stuck to the sketch very closely with the exception of the colors. In the sketch I used cream and turquoise. I didn't have any turquoise cardstock, but have plenty of dark green. I started by cutting diamonds of graduated sizes from scrap pieces of cream cardstock, halved some of them and arranged them in the shape of a tree. I added a hand cut tree trunk and highlighted it with a white colored pencil. Next I used a paper crimper to add texture to a piece of green cardstock and used it as a mat on the cardbase. I added a half circle on the left and attached a strip of green to it. 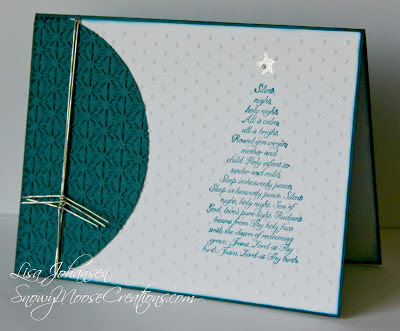 I used punched stars and a handwritten sentiment to finish the card." 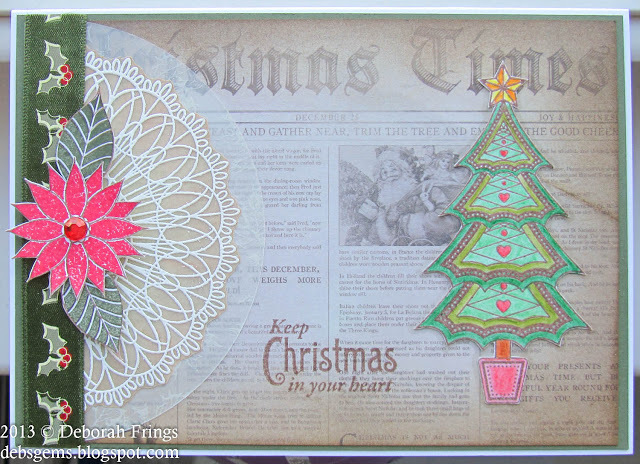 Lauren says, "I had a completely different idea, which used Brenda's gorgeous sketch in a more traditional way, but flipping through my fabulous MME "All is Bright" paper pad, I found the perfect curve... being used as a sort of bunting at the top; which made me decide to rotate the sketch, add a few more fussy-cut collage elements, and layer the heck out of everything! I have to say (rather immodestly!) that I am pretty pleased with the results!" Stephanie says, "I used a snowman from The Crafty Christmas Stack by DCWV, Chipboard Snowflakes and Buttons from Paper Issues, and an SRM Sentiment sticker for this quick and festive holiday card." 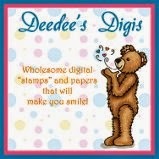 Now we cannot wait to see what ♥YOU♥ will do with Brenda's beautiful sketch! Link up here between now and Wednesday, February 27 at 6pm (EST). Keyword for galleries and our Flickr group is JB:13:04. Have fun, and be creative! hail the SNOW (and ice... and watercolor...) QUEENS! went above and beyond in the field of meritorious coloring, then embellished this adorable image to perfection for her lovely and intricate card! made *THREE* unique and beautiful cards for this prompt: this astonishingly gorgeous watercolored sky; a brilliant use of spray ink + template; and a wonderful stamped CAS masterpiece; some of which were "homework" for an online card class... proving that even really accomplished papercrafters can always learn a few awesome "new tricks"! ...and incredibly GORGEOUS holiday cards are the result of the wonderfully inspiring "HO HO H20" prompt, suggested by our lovely guest star, linda of snail's space! we couldn't resist another go at this fun idea! 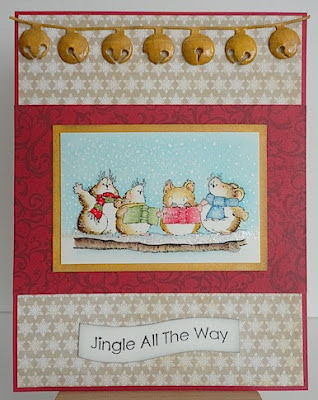 Linda says, "I love colouring cute images that make me smile; this was coloured with distress inks and the jingle bells were coloured with distress stain and shaped with a stylus." 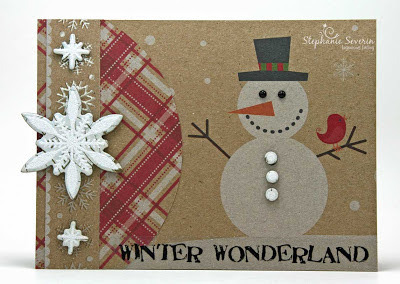 Stephanie says, "For this week's card, I started by sanding Cord'dinations dotted cardstock and then sprayed it with several pumps of Whipped Cream Memories Mist, which reminded me of the splatter of snow when a snowball hits its target. 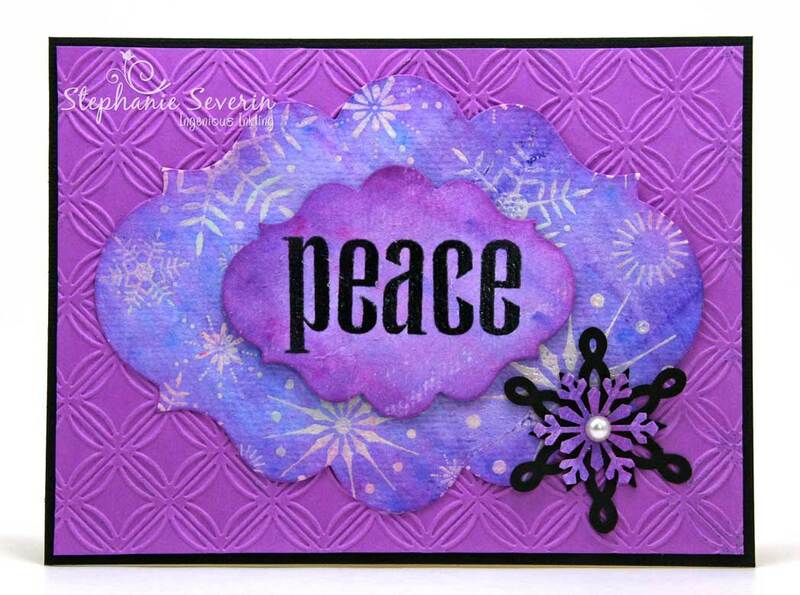 So next, I added glittery City Sidewalks chipboard snowflakes and a Winter SRM sentiment to finish the design, using this week's Retro Sketch." 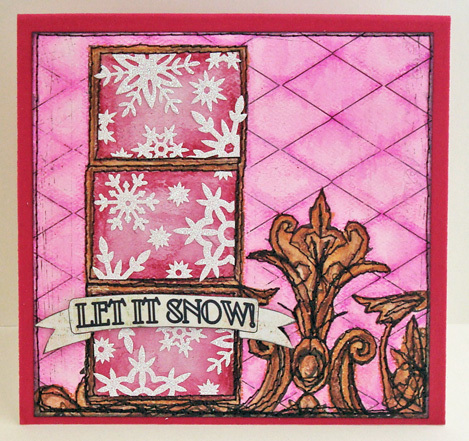 Lauren says, "we've told you before that stephanie and i never compare notes, and even though she's often done her card before i start mine, i tend to not go and look at it, to keep from being 'influenced' by her awesome ideas... and yet... sometimes things like this happen: two snowy cerise cards based on this week's retro sketch! loooooooooove that!!! :) mine uses a prima 'paintable' 6x6 paper as its base, which i've colored with water-soluble wax crayons before adding martha stewart sparkly snowflake stickers and then finally going crazy with my sewing machine." you've still got nearly a week to join our fun... if you need a little more inspiration, scroll down and check out our fellow belles' amazing creativity in the reader gallery! 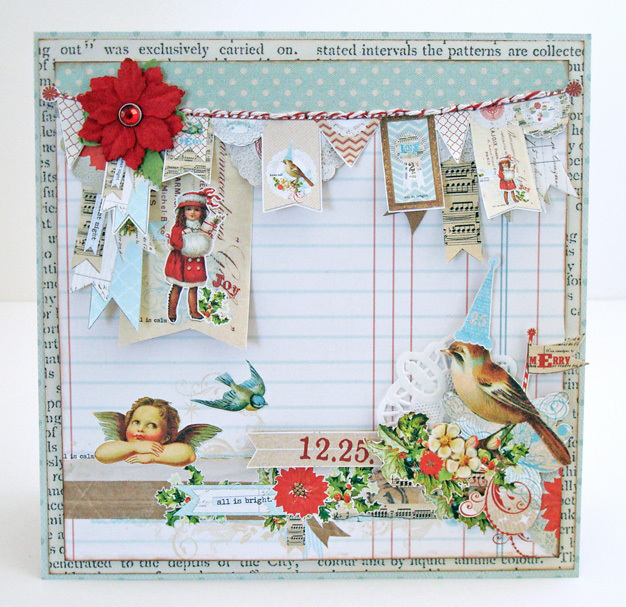 Hello, ♥JINGLE BELLES♥ and welcome to our very favorite title of the year so far! 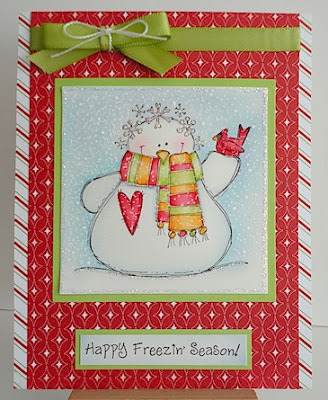 You might be wondering what we mean by "Ho Ho H20" so we'll cut right to the chase: this time we're asking you to create a holiday card which features icicles, snow, frozen ponds, or any water-related image; OR use water-based products on your project, such as watercolor paints, water-based markers or sprays, etc. This fabulous idea comes to us from one of our favorite fellow belles, Linda, of Snail's Pace, who is our lovely guest star* this fortnight! 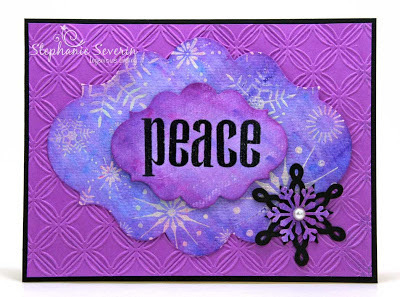 We're quite sure you've seen many of her gorgeous cards on her blog, in our various galleries (and several "shout out" posts!) but let's get to know her a little bit better! "Hi, my name is Linda and I LOVE to colour with a paintbrush and usually distress inks, but I also use water based markers, watercolour pencils and twinkling H2Os, which is how I came up with the idea for this prompt. Severe rheumatoid arthritis forced me to give up all of my creative activities so I was happy to discover I could stamp and colour. 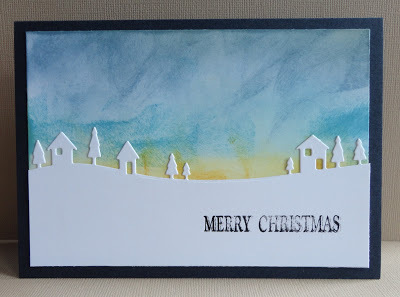 I’m currently a design team member of the Penny Black and More challenge blog and my local stamp store, Papercraft Cafe. Thank you Lauren and Stephanie for inviting me to play along!" 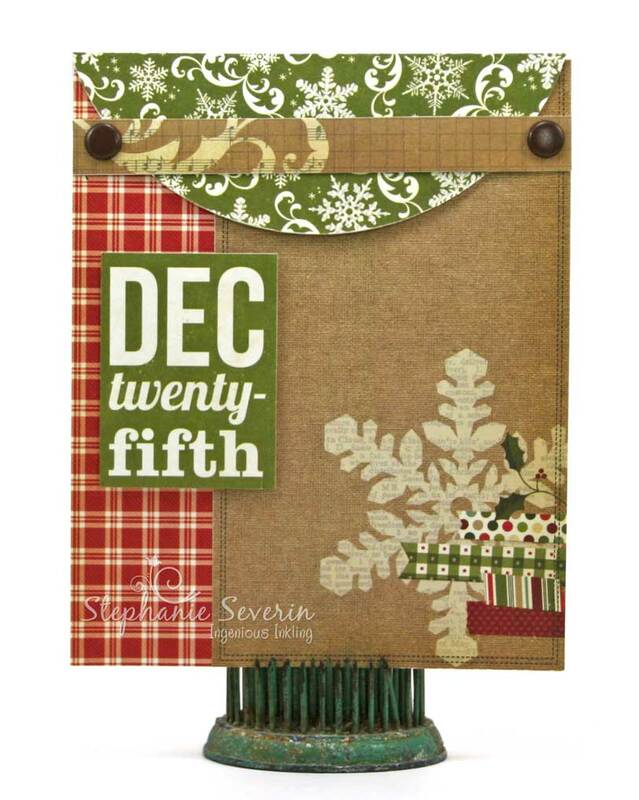 Linda says, "I try to balance clean and simple with patterned papers and keep the image as the focal point. I coloured this snow woman with both letraset aqua markers and distress inks and added stickles to her hair." 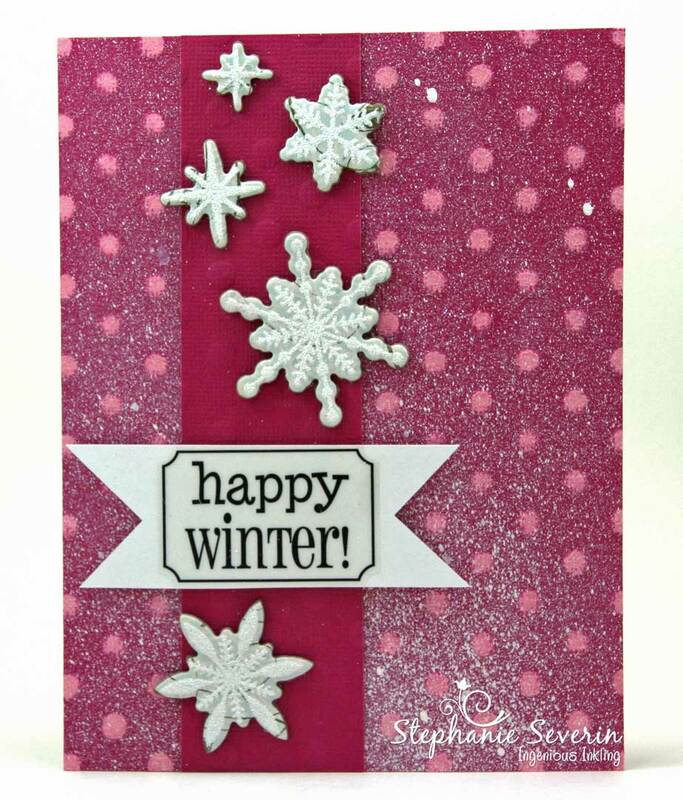 Stephanie says, "I started by clear embossing Hero Arts Sparkling Snowflakes & embossing my black sentiment on watercolor paper. Next I used Derwent Inktense Watercolor Pencils, sprays of water, and my fingers to create my water-washed background. I embellished with a snowflake punched from a scrap of the water-washed paper." 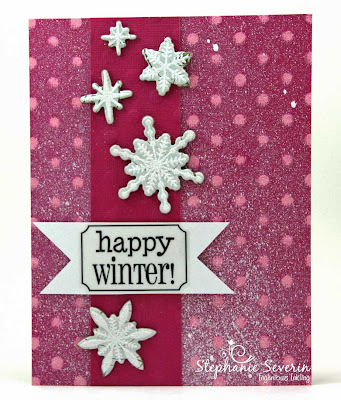 Lauren says, "i had the intention of making something intricate and inky, so i'm not exactly sure how i wound up going soooooooo far in 'another direction', lol! 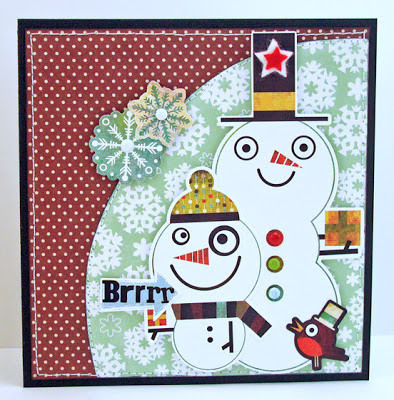 but i adore these funky snowmen and when i stumbled across them in my xmassy stash, they just sort of took over the whole card! this offbeat style is PERFECT for my friend josh, so i just went with it; since he doesn't celebrate christmas, as such, i kept my design and sentiment more general. by the way, if you don't happen to celebrate christmas, but love to make hanukkah or other "winter holiday" cards, they are always most welcome here at JINGLE BELLES! we ask that you observe whatever the current prompt is, but we do try to make most of our themes as flexible as possible, and we hope that EVERYONE can come along and feel welcome!" So how will you "roll" with this one? Will you focus on water-based products, or concentrate on more thematic watery elements, like snow and ice? Or maybe combine the best of both worlds, like Linda did so beautifully? Whatever you choose, we can't wait to see it! Link up between now and 6pm (EST) on Wednesday, February 13th; the keyword for galleries and our Flickr group is JB:13:03! *If ♥YOU♥ have a great idea for a prompt, or if you'd just like to come along some week and make a card with us as our "lovely guest star" we'd love to hear from you! 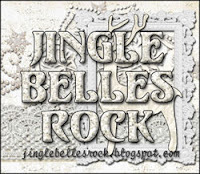 Email us at jinglebellesrock @ hotmail [dot] com!